Bingo! is associated with youth, fun and excitement. It fulfils the consumers need for variety and novelty in snacks. "Apna Asli Flavour, Bhoolna Never"
Authentic flavours gently sprinkled on chips made from golden quality potatoes. Available in 4 exciting flavours. 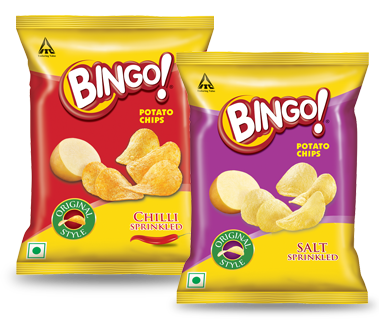 ITC has carved a niche for itself by creating yet another winner product in the form of Bingo! Original Style. These come in two delectable flavours of Chilli sprinkled and Salt Sprinkled. Savour the unique combination of perfectly sliced potatoes along with carefully sprinkled spices. One of the biggest successes from the Bingo! Portfolio, Bingo! Mad Angles has carved a niche for itself in the consumers mind and is synonymous with the perfect triangular snack. A combination of innovative flavours on a traditional khakra base, Mad Angles is a snack that is true to taste with perfect flavour delivery as well as shape, making it a snack that's truly "Har Angle se Mmmm ..."
Bingo! Tedhe Medhe is the popular spindle shaped format from Bingo! that is a delicious blend of handpicked spices with an aroma that makes one crave for more. The taste of fiery sparks which masalas leave on ones tongue is an experience with savouring! Bingo! 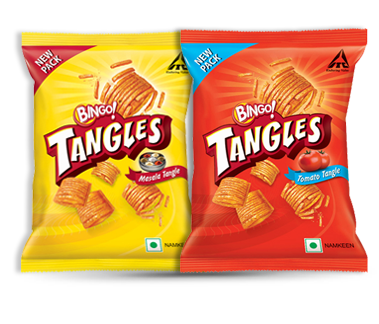 Tangles is one of the most innovative snacks available in the market. Each piece of this innovative crunchy snack is made out of strands loaded with lip smacking masala or tantalizing tomato or simply salted flavours. Once bitten, they break into many more delicious strands in the mouth. It is so tasty that you can't resist sharing it with others. "Banao Masti ke Apne Rule"
Bingo! Mad Angles Mmmmm Masala!